The Deschutes River population of wild spring Chinook salmon is in trouble. A pre-season run forecast by the Confederated Tribes of the Warm Springs Reservation (CTWS) and the U.S. Fish and Wildlife Service predicts that in 2018, only between 127 and 448 adult wild spring Chinook will return to the Deschutes River to spawn in the Warm Springs River. This predicted return is considerably lower than the average return over the last 10 years of 685 wild fish, which itself is only around half of the optimum escapement goal for the run (identified in Oregon’s Administrative Rules as 1,300 fish per year). As an organization concerned with the health and abundance of all wild fishes in the Deschutes River, DRA finds this prediction very alarming, and is focused on understanding why this decline is happening and what can be done to reverse it. As with other wild salmon runs in the Pacific Northwest, there are several possible explanations for the decline of Deschutes River wild spring Chinook. But there is one very likely culprit that DRA feels is being ignored. In recent years, there has been a dramatic increase in the lower Deschutes River of the parasite Ceratonova shasta. This salmon-killing parasite, historically not a significant mortality factor in the lower river, is now abundant, and is having demonstrable impacts on spring Chinook. Recent studies and observations show that it is infecting and killing juvenile Chinook in the lower Deschutes, and may also be responsible for high pre-spawning mortality of adult spring Chinook. This rise in Ceratonova shasta is likely causing significant harm to the already fragile wild spring Chinook population, and also jeopardizing efforts to reintroduce spring Chinook above the Pelton Round Butte Hydroelectric Project, as those reintroduced juveniles and adults must migrate through the Deschutes River’s lower 100 miles on their journey to and from the ocean. Why is this happening now? What more can be done to protect this important and fragile population of wild spring Chinook salmon? Lower Deschutes River Chinook salmon. Photo by Brian O’Keefe. To understand why this parasite is so prevalent now, some background on the organism and its life cycle is important. Ceratonova shasta (or C. shasta), which is microscopic in size, is present in many Pacific Northwest streams and can be lethal to some salmonids, including Chinook salmon. It has been extensively studied for many years, and some of the original life history research on the parasite’s life cycle was done in the Deschutes River system. C. shasta has an interesting life cycle in which a small polychaete worm, Manayunkia speciosa, serves as an intermediate host which sheds the infective C. shasta organism into the water. This stage of the organism, the actinospore, then infects a fish, and the parasitic infection can be lethal from harm to the kidney and digestive system. Historically, C. shasta has been more prevalent in warmer southern Oregon rivers, and was not thought to be a significant problem in the lower Deschutes. Unfortunately, this no longer appears to be the case. According to the U.S. Fish and Wildlife Service, in 2014 staff at the Warm Springs National Fish Hatchery observed returning adult spring Chinook infected with C. shasta. Additional studies found that both juvenile and adult Deschutes River Chinook were dying prematurely, with C. shasta the suspected cause. And a recent study in the lower Deschutes River demonstrated unusually high levels of C. shasta spores in the water, as well as high levels of C. shasta-related mortality in caged spring Chinook juveniles. Disturbingly, in a sampling site located near Oak Springs Hatchery (located just downstream from Maupin) as many as 87% of caged juvenile Chinook were infected with C. shasta after being exposed to Deschutes River water for 72 hours. Various explanations have been offered for the increased presence of C. shasta in the lower river, including increases in water temperature due to climate change. However, DRA believes there is a more fundamental explanation for the marked increase in the C. shasta parasite documented these last few years—an explanation we have not yet seen in discussions around the topic. Based on available information and data, it appears that the increase in C. shasta may be directly related to operations at the Selective Water Withdrawal (SWW) tower above Round Butte Dam. Since SWW operations began in late 2009, water quality on the lower Deschutes has declined—largely due to the warmer and nutrient-rich surface water from Lake Billy Chinook that is being passed downstream into the lower river. This abrupt change in water quality has also changed the macroinvertebrate community below the Pelton Round Butte project. This has included significant increases in non-insect taxa, including in the presence of Manayunkia speciosa—the polychaete worm that serves as the intermediate host for the C. shasta parasite. While pre-tower sampling in the lower Deschutes did not collect any M. speciosa, post-tower studies in the same locations have collected as many as several thousand M. speciosa individuals per square meter of stream bottom. Similarly, DRA post-tower sampling efforts have collected as many as 8,285 M. speciosa per square meter at Dizney Riffle. This dramatic increase in M. speciosa is likely a significant factor, if not the driving factor, in the new and increased prevalence of the C. shasta parasite, and the subsequent harm that is resulting to the Deschutes River spring Chinook population. This hypothesis is supported by CTWS data showing a dramatic increase, since 2010, in the percentage of adult spring Chinook that are being counted at Warm Springs National Fish Hatchery and passed upstream, but then dying before they are able to spawn. The chart below reflects data collected on wild spring Chinook in the Warm Springs River from 1977-2016. The chart shows the number of wild fish counted at Warm Springs National Fish Hatchery, divided by the number of Chinook redds counted in spawning ground counts later in the year. (“fish per redd”). A larger number of fish per redd means that more fish died after they were counted at the hatchery and released upstream to spawn naturally, but before those fish were able to spawn. Fish per redd in WSR basin, 1977 – 2016. From Confederated Tribes of the Warm Springs Reservation of Oregon Natural Production Monitoring Progress Report, January 1, 2015 to December 31, 2016. BPA Project # 2008-311-00, BPA contracts #: 64276, 69558, 73078. Authors: Graham Boostrom and Cyndi Baker. As you can see, the average number of “fish per redd” in the Warm Springs River jumped from 4.0 from 1977-2009, to 13.1 from 2010-2016. (Further, an astounding 19 adult spring chinook were required to result in one redd in 2016, and 24 adults were required in 2017). In other words, there has been a marked increase in pre-spawning mortality since 2010, which coincides with the commencement of SWW operations in late 2009. These pre-spawning deaths could very well be attributable to Chinook adults being infected by C. shasta on their trip up the Deschutes mainstem. In sum: The increased presence of C. shasta in the Deschutes River is likely due in significant part to marked increases in the parasite’s intermediate host in the lower river, which in turn is likely due to changes in water quality resulting from SWW operations. And the C. shasta parasite is having a very real impact on spring Chinook salmon in the Deschutes River: it is clearly killing juveniles, and is very likely infecting and killing pre-spawning adults as well. More information is needed on C. shasta’s present impacts on Chinook salmon in the Deschutes basin. And it is imperative that basin stakeholders take a hard look at the role of SWW operations in the rise of this fish-killing parasite. C. shasta is not just impacting the threatened wild population of Deschutes River spring Chinook: it is likely playing a role in the extremely low numbers of spring Chinook returning to the Pelton Round Butte Project as part of fish reintroduction efforts there. We call on the agencies responsible for the management of this wild run of spring Chinook to acknowledge these impacts, study the situation, and take aggressive action to stop the loss of these fish before it’s too late. The present decline in wild spring Chinook numbers would predict an extinction event unless such aggressive action is taken. It is time to stop blaming ocean conditions and climate change for this problem, and acknowledge that there are immediate actions we can take that would likely reverse the decline of this treasured wild run. Click below to watch the DRA’s recent documentary film, A River Worth Fighting For, that touches on many of these same issues. On Monday night, March 5, the Deschutes River Alliance filed a motion in Federal District Court, asking Judge Michael Simon to find Portland General Electric liable for its violations of the Clean Water Act at the Pelton Round Butte Hydroelectric Project. In this “Motion for Summary Judgment,” the DRA outlines well over 1,000 instances over the past several years in which PGE has failed to comply with water quality requirements for temperature, pH, and dissolved oxygen at the Project. This motion is the latest step in the DRA’s fight to enforce the Clean Water Act and restore the Deschutes River. The document is now in the public record, but we link to it here for your convenience. In it, DRA argues that the relevant water quality requirements, and PGE’s own monitoring data, make clear that PGE is regularly violating the terms of the Project’s Water Quality Certification. The DRA brought this Clean Water Act “citizen suit” against PGE in August 2016. PGE is required to operate the Pelton Round Butte Project pursuant to a Clean Water Act certification, which identifies several water quality requirements—all agreed to as part of the Project’s licensing process—related to water discharged from the Project. These requirements are there to ensure that Project operations comply with all relevant Oregon water quality standards and, in turn, to protect aquatic life in the lower Deschutes River. However, since SWW operations began, PGE’s own monitoring reports demonstrate hundreds of days where the Project is not meeting these requirements. In Fall 2016, PGE filed a motion to dismiss the case, arguing that citizen groups like the DRA do not have the authority under the Clean Water Act to bring a lawsuit like this one. In an important victory for advocates of clean water, DRA prevailed on that issue, allowing the case to move forward. Now, for the first time, the merits of the case have been presented to the Court. DRA’s motion will be followed by three months of briefing from both parties, culminating in a courtroom appearance for oral arguments on July 17. If the issues in this motion are not fully resolved after that appearance, a full trial will follow in early December. Since this case was initially filed, we have completed nearly two years of research, analysis, and organizing—and won an important battle along the way protecting citizens’ rights to enforce the Clean Water Act. Now, we are thrilled to be moving forward to address the merits of this important case. The DRA believes that compliance with all water quality standards at the Pelton Round Butte Project is an essential first step to restoring this invaluable river, and we are eager for the fight ahead to ensure these standards are met. As always, this fight would not be possible without your incredible support. To all the individuals, businesses, fellow NGOs, and foundations that have gotten us to this point: Thank you! Keep an eye on the DRA blog for updates on this case as they develop. Below, watch the DRA’s newest video: A River Worth Fighting For. We are proud to present the DRA’s new documentary video! Titled A River Worth Fighting For, the video examines why Selective Water Withdrawal operations at Round Butte Dam are negatively impacting the ecology of the lower Deschutes River. Then, featuring interviews with Maupin government officials and business owners, the video highlights how these ecological changes are harming businesses and communities that depend on a healthy Deschutes River. 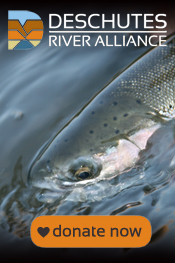 And it details the efforts of the Deschutes River Alliance to fight back. The video premiered last Saturday, February 11, to a full house at the DRA’s second annual Gathering and Auction. It was a fantastic afternoon, with attendees showing incredible support for the DRA’s efforts on behalf of the lower Deschutes River. Look for a full recap of the event in the days to come.